We are very proud to announce that Peter Miller, site manager for Zenith House Developments, has won the small builder category for the whole of the North West in the NHBC ‘pride in the job’ awards. This recognises his outstanding work at the St John’s Gardens new homes development at School Lane, Sandbach Heath. 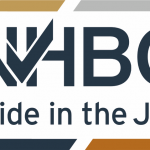 This prestigious award from the NHBC (National House-Building Council) is offered to building professionals who demonstrate high levels of dedication to building homes of exceptional quality. From over 16,000 national entries only one small builder in the North West is selected to compete in the national finals in January 2019. 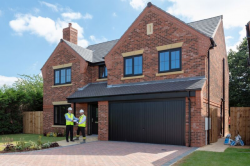 The prize was offered for exceptional building standards at the St John’s Gardens development at School Lane, Sandbach Heath which consists of 13 houses, nine of which are detached family homes. The development has proved so popular with home-buyers that only one property is now available. The prize was awarded at a ceremony in Manchester and we will now go through to the final round of national winners in January 2019. 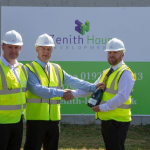 Zenith House Developments’ Site Manager, Peter Miller has won an NHBC pride in the job award for his exceptional work, building high quality new homes at St Gardens, Sandbach Heath in Cheshire. A new award-winning development at St John’s Gardens, Sandbach Heath provides a unique opportunity for Cheshire homebuyers to find a luxury, family home in a great location, in an exclusive and secluded setting, yet close to local amenities and transport links. Choose your dream kitchen from a wide range of options to make your own personal statement in your new home from Zenith House Developments. 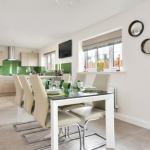 Why Choose an NHBC Registered Home from Zenith House Developments? Choosing a new home can be one of the most important buying decisions of your life. Choosing a home from an NHBC registered and prize-winning builder can offer great peace of mind.